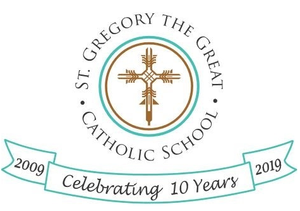 St. Gregory the Great Catholic School 10th Year Anniversary! 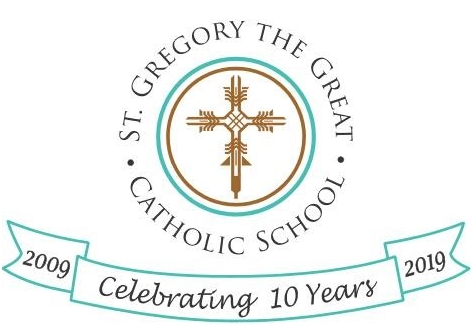 St. Gregory the Great Catholic School begins this calendar year celebrating our 10th anniversary of the opening of our school. In 2009 we started out with just 65 students in kindergarten through fourth grade, adding a grade each year until we had the first graduating class in June of 2014. In fact, the graduating Class of 2018 was the first group to begin their education journey at St. Gregory the Great kindergarten in 2009! St. Gregory the Great Catholic School campus was expanded last year to include a science lab, learning center and preschool. In response to requests from the community, a two-year-old program was added to the three and four -year -old programs and preschool hours were extended to 4:30 PM to meet the needs of our families. The addition of a STEM-Robotics program to our curriculum, as well as participation in the Diocese of San Diego’s Academic Decathlon competition further enhances the many opportunities available to our student body. Faith families continue to demonstrate the connection between students from the different grade levels. Our sports teams constantly amaze us with their Guardian grit, teamwork, and sportsmanship. We are particularly proud of the varsity boys’ flag football team, which went undefeated for the second year in a row this past season, winning the San Diego County Parochial Championship.